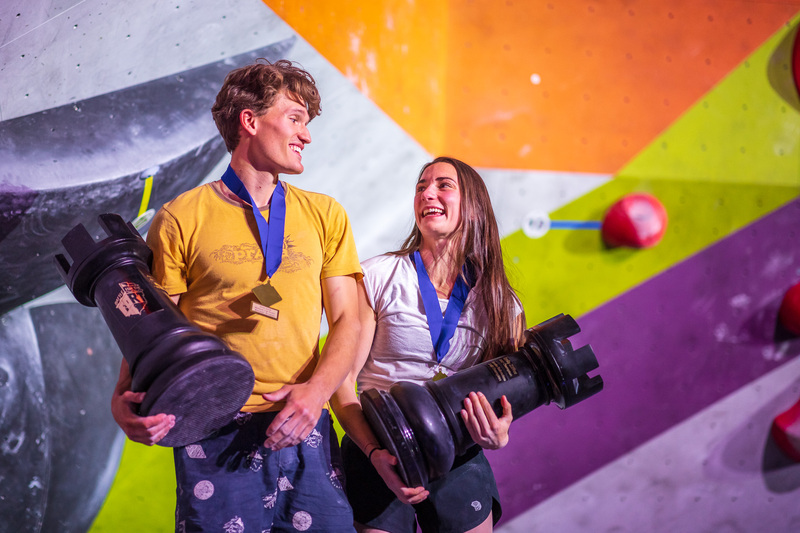 Ascent Studio and the Fort Collins climbing community hosted the 4th stop in the National Cup Series Bouldering Competition for 2018 - The Battle for the Fort. Friday evening over 150 pro competitors threw down in two qualifying heats to determine the 8 men and women who would compete for top honors and a $10,000 cash purse. For qualifiers the routesetters put together 10 problems for the men, and 10 problems for the women. After those qualifying heats the setters filled in 30 additional problems for the next day's collegiate and citizens competitions. Over those two rounds nearly 100 psyched competitors enjoyed the camaraderie, encouragement, and heckling that all climbers share working on a fine set of new blocs. Within minutes of the last citizens competitor stepping off the wall the setters began stripping most of those problems and put up 8 amazing blocs for the NCS Finals event. At 5:30pm the gym started filling with spectators ready to cheer for the real Battle for the Fort and enjoy some great beers from Intersect Brewing and Rally King Brewing. Nathaniel Coleman and Kyra Condie shared a moment atop the podium after winning $1500 each for their 1st place finish in the Battle for the Fort. Complete results for all of the National Cup Series events can be found here. Colorado in Motion Physical Therapy Specialists graciously helped support the cash purse and also gave free assessments to athletes throughout the two days of the event.